Since I am in the real estate business in the mountain resort town of Lake Placid, NY, I frequently work evenings and weekends. Last weekend was one of those times. Last Sunday morning I had work to do - I had to ski out to a boat access only camp we have listed and take interior photos for a client. 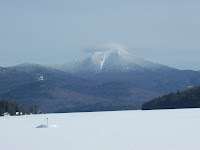 Today's blog photo is a shot of Whiteface Mountain, taken from frozen Lake Placid, last Sunday. It was a beautiful day, a lovely ski, and not bad duty for work. Here is a link to interior photos of Camp Agawam, one of our Lake Placid waterfront listings.